DeltaVision Elite is a fully integrated, flexible, widefield fluorescence microscope optimized for live cell imaging. The DeltaVision Elite’s efficient light path and optimized deconvolution algorithm combine to deliver superior image quality while maintaining cell viability. Fully integrated system for seamless operation. Automated illumination mode improves contrast for better image quality for a wide variety of sample types. Unique light path enables low light imaging of sensitive samples like yeast, bacteria and live cells. Modular platform design allows for future upgrades to expand capabilities. Deconvolution improves image x, y, and z contrast and resolution without sacrificing data integrity. Our exclusive deconvolution algorithm facilitates quantitation and enables faster data visualization by on-the-fly image deconvolution. 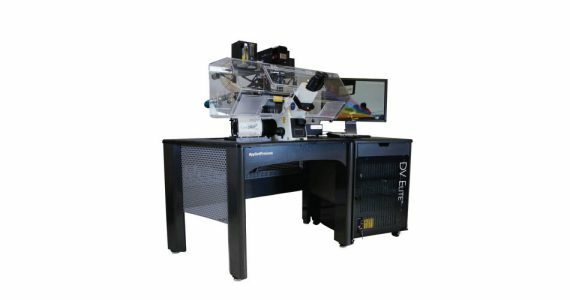 DeltaVision Elite can handle most imaging applications, including widefield fluorescence microscopy, time-lapse live cell imaging, multi-point cell tracking, total internal reflection fluorescence (TIRF), fluorescence resonance energy transfer (FRET), Photokinetics (PK), and differential interference contrast (DIC). UltimateFocus incorporates an exclusive patented design to quickly and precisely maintain focus regardless of mechanical or thermal changes that can impact your experiment. UltimateFocus also enables Focus Assist, which preserves cell health by allowing the user to focus on the sample without using the eyepieces or the camera. Our patented Flexure stages and exclusive NanoMotion III Precision Control motors ensure precise stage movement and stability with excellent repeatability for multi-point sampling during time-lapse experiments.